I have a few blaberid nymphs that I found in a cage in which I now rear Peruphasma schultei. I assumed they were a Blaberus sp. 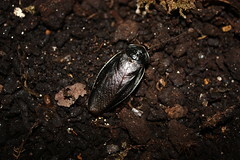 that I had kept there recently, however it seems they are of Byrsotria fumigata. If a female turns adult I will post more photos. BugFest organiser Nick Wadham and the Phasmid Study Group's Cameron Die Köinign at the Abbey Hill Steam Rally. This is a commonly kept species in culture that originally comes from Madagascar. They are perhaps best known for their ability to make a loud hissing sound by forcefully expelling air through modified spiracles. In case you are wondering this one is on top of it's food bowl and is reared mainly on premium dry cat food, supplemented with fresh fruit and vegetables. 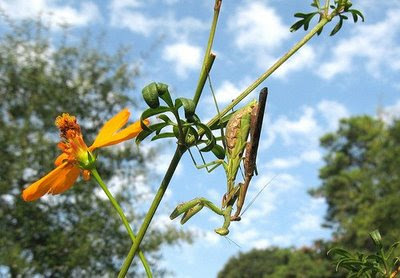 Here it is finally, my Nature Live on stick and leaf insects. 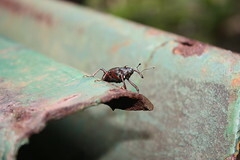 Phasmids: The Great Pretenders from Ed Baker on Vimeo. You may remember that I did a Nature Live event at the Natural History Museum back in May. Well, if all goes to plan I should have the DVD of it on Friday so I can upload it over the weekend. The title was 'The Great Pretenders' and the subject was the phsmida - stick and leaf insects. Since the last time I mentioned the Nature Blog Network we have shot up to number 13 in the invertebrates category. Thank you all for your support! 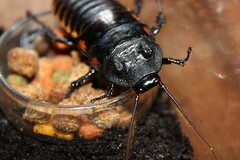 Commonly known as the "Lobster Roach" Nauphoeta cinerea is a mid-sized Blaberid widely used as food for those interested in keeping predatory insects, reptiles, etc. 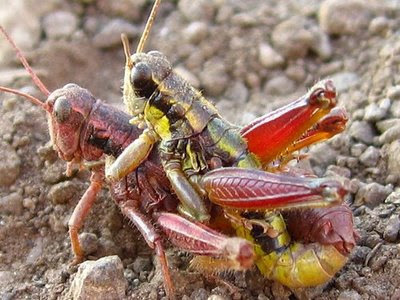 This species is fast breeding, and colonies can increase in population very rapidly. 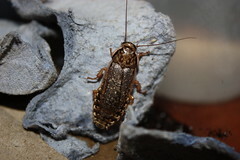 More cockroach posts coming up! As usual click on the photo to see more of my photographs of this species on Flickr. 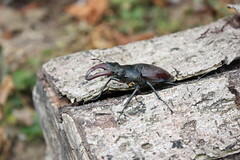 This photo is of a male stag beetle that I pulled out of my friend's pond. Given it's rigidity and complete lack of movement for several hours we assumed it was dead, until it moved. It turned out to be well and truly alive and strated becoming very active. OK, it may not have actually come back from the dead, but it makes a good story. 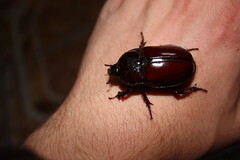 Incidentally I have pulled many drowned stag beetles from ponds, which isn't good news. However around Windsor they are pretty common (I saw two males in flight on a short walk back from the pub the other day). 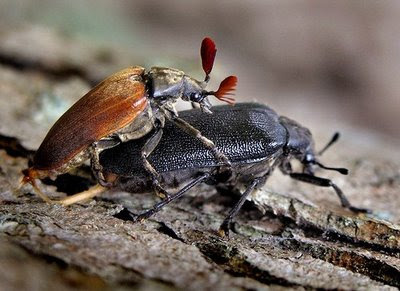 When I was in primary school we used to collect the dead remains of stag beetles that had become prey to carrion crows. This beetle was attracted to fluorescent lights outside of a guest house we were staying at on the outskirts of Alajuela. Identified by Conrad Gillet (currently an entomologist at the National Zoological Collections of Suriname). Head over to my Flickr for more photos. 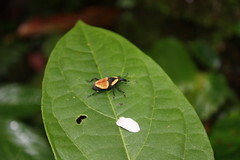 This rather brightly coloured weevil was found near the research tower at Santa elena Biological Reserve (close to the more famous and moure-touristed Monteverde reserve). 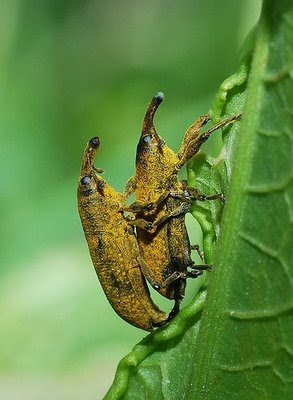 i can't tell you a great deal about it, other than other species in the genus are considered to be pests. Thanks to Chris Lyal for the identification. 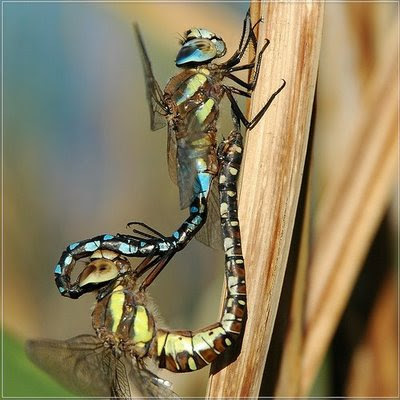 bHere are some pretty amazing photographs of insects caught in the act. For even more head over to Insects In Flagrante on Webphemera. The Bumblebee Conservation Trust is currently giving away copies of its 'Gardening for Bumblebees' book until the end of June.